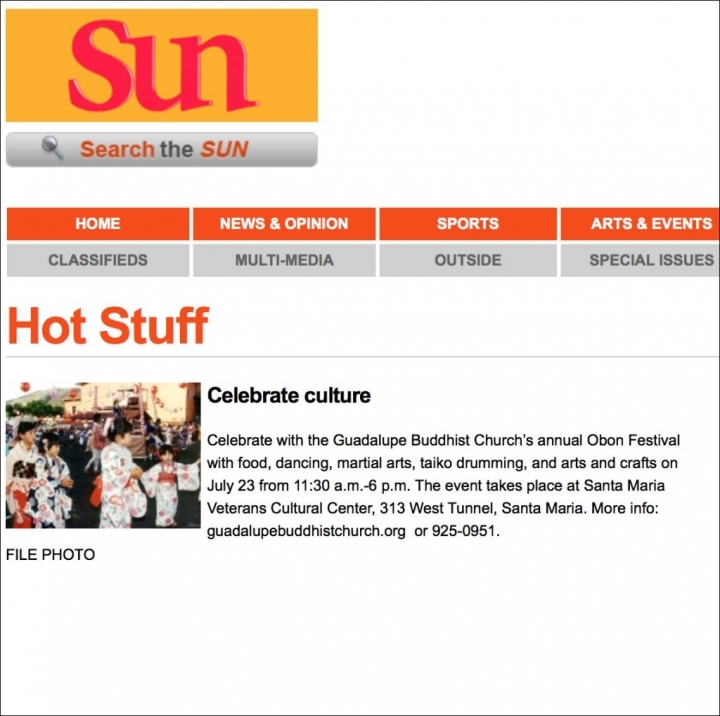 Guadalupe Buddhist Church welcomes the public to the annual Japanese Obon Festival. Members of the church hold the event to express gratitude and honor to their ancestors who first initiated the observance and pay respects to those who passed during the year. Attendees will have a chance to taste authentic Japanese cuisine, listen to taiko drums, watch martial arts demonstrations, and view intricate art of the Bonsai. The event will also feature a raffle, arts and crafts for children, and a traditional bon odori dance, which everyone is invited to participate in. The Japanese Obon Festival takes place July 23, from 11:30 a.m. to 6 p.m. at the Santa Maria Veterans Memorial Cultural Center, 313 E. Tunnel, Santa Maria. More info: guadalupebuddhistchurch.org.